DENVER – Police Chief Robert White plans to retire from the Denver Police Department, and his replacement will come from within the department, the city announced Tuesday. White’s departure announcement comes just weeks after Mayor Michael Hancock announced that White wouldn’t be disciplined after a pair of administrative reviews of his role in a 2017 car crash and a public records spat with the former district attorney. His planned retirement was first reported Tuesday by The Denver Post ahead of the city’s announcement. The city’s announcement says White will depart the office once his replacement is appointed. The replacement will be either a current or retired Denver Police Department officer, according to the city. The search committee, which will identify candidates, will be picked by Hancock, and four community forums will be held so the public can weigh in on the next chief. Candidates will then be forwarded to Hancock and Executive Director of Safety Troy Riggs before Hancock picks White’s replacement, the city said. He additionally posted a message to Facebook. Hancock praised White for his six-plus years of work in the department following his 2011 appointment. “Through his great work, he has firmly established a legacy of building strong community relationships and a police department better equipped and prepared to keep our neighborhoods and residents safe, and I wish the Chief all the best in his much-deserved retirement,” Hancock said. When White was cleared from discipline earlier this month after the two reviews, Hancock said White “should have exercised more professionalism and clarity in his conduct” in the two incidents, but said White didn’t violate department policies. In the first incident, White was investigated for his department’s handling of allegations of sexual assault involving a then-officer and for disputes about public records between the department, the district attorney’s office, and the police union. Denver Police Protective Association President Nick Rogers blasted Hancock’s decision earlier this month, and said last October that officers had no confidence in White’s ability to lead the department. The second review stemmed from a hit-and-run accident in which Chief White was a victim while off-duty in his department vehicle September of 2017. White followed the alleged suspect and made comments about a “chase,” and apologized for making a joke at the scene to Aurora police that sources told Denver7 Investigates may have disparaged his own department's response to the scene. In a statement that followed the reviews, White said that his reputation had been “impugned…for more than a year,” but he also said he was moving past the incidents. 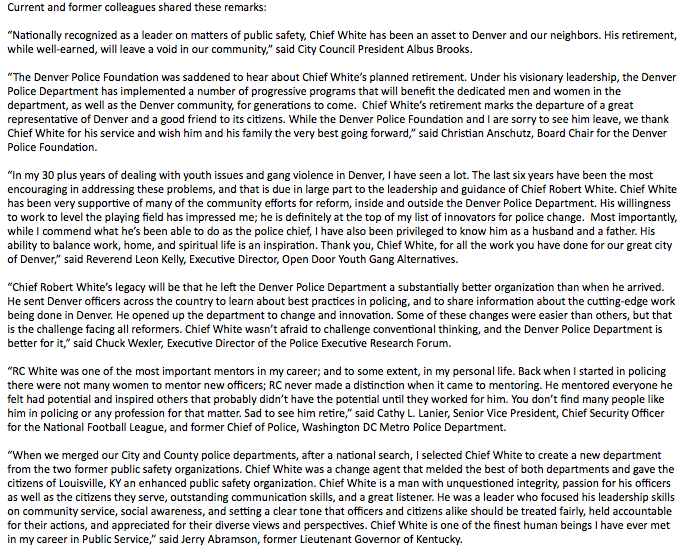 The city also released a host of statements from public officials on White’s tenure, and a list of his accomplishments. This is a developing news story will be updated.